Following a six-year second wind with Canadian metal greats Voivod, founding bassist Jean-Yves Thériault (a.k.a. Blacky) has once again left the band. The group confirmed in a statement on Facebook today (July 11) that Thériault is out of the group and will not be playing with the rest of the troupe at tomorrow's Festival Jonquière En Musique in their native Jonquière, QC. The specifics on his reasons for leaving are limited. 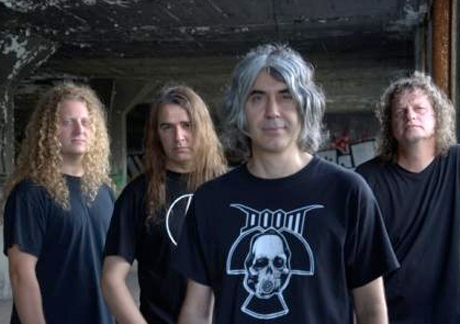 "It saddens us to announce that Voivod will no longer be performing live with Blacky," the group posted. "Jean-Yves has decided to leave the band for his own personal reasons. We wish him all the best. Voivod will carry on." After initially taking leave from Voivod in 1991, also for "personal reasons," Thériault co-founded dance troupe the Holy Body Tattoo Dance Society and did score work before rejoining in 2008. In that time, he performed live with the band and contributed bass work to 2013's Target Earth. The group's 2009 effort Infini featured Jason Newsted on bass. It's unclear who will be stepping in for the absent bassist at tomorrow's show. Furthermore, Blacky has yet to make a statement of his own regarding the departure.